I have been asked to be a moderator for ScienceOnline 2013 (http://scio13.wikispaces.com/Program), me and Glendon Mellow (http://glendonmellow.blogspot.com/) will be moderating a discussion about STEAM Education – putting the Arts into STEM education. This ties really nicely into my weekend activities. This weekend my family had a birthday party for my Grandma Yetta, who just turned 99 years old. She's like Yoda; she's very independent and will waive a stick at you and tell you what to do. Even though the event was immediate family only, it was sort of a creative definition of immediate family, more like mishpucha that Grandma sees often, which includes my uncle's best friend and his grandchildren, Emily (7 years old) and Joseph (4 years old). I spent a very enjoyable afternoon sitting on folding chairs in Grandma's huge, sunny back yard, drawing with Emily and Joseph. 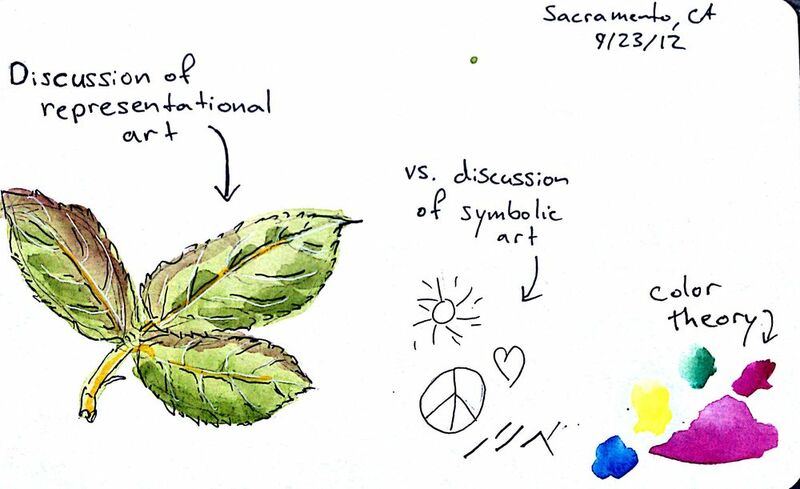 They each chose leaves they liked and after a brief discussion, we drew what we saw. Emily in particular did a nice job, she chose a cluster of rose leaves and she carefully recorded the veination and serrated edges. So how does art relate to science education? I'd say that its a useful tool for both recording your observations and sharing them with others, integral parts of the scientific process.